This lab is based partly at the University of Tokyo in Kashiwa, and partly at AIST in Odaiba, central Tokyo. Our ultimate aim is to decipher the functional and historical information in genome sequences. We do this using statistical models (such as hidden Markov models) and computational methods (such as enhanced suffix arrays and dynamic programming). A major approach is “the comparative method”, which is widely used in biology and philology to understand where things come from, and thus “what they are”. Another planned approach is to look for co-evolution, as a signal of interacting genomic loci. One recent focus is characterization of genome rearrangements in evolution and disease. We recently published a new method that identifies rearranged orthologous regions in a statistically rigorous fashion . This should help us to understand how genomes and genes have evolved. Another interest is “simple sequences”, which occur in all genomes. Simple sequences evolve extremely rapidly, and thus contribute strongly to phenotypic variation and disease (e.g. Huntington’s disease). I developed a method to identify them, named tantan, which appears to capture them much better than other methods . Fig.2 Two types of “complex” simple sequence. Another long-term interest is promoter sequences and DNA motifs that regulate gene expression. The aim is to understand the function and evolution of features such as CpG islands, and ultimately the DNA “code” that controls gene expression. Fig.3 Direct correlations (solid) and anticorrelations (dashed) among properties of promoters . Further interests are everything “weird”: malaria genomes (80% A+T), frameshifts (especially in microbial metagenomes), unexplained evolutionary conservation, trans-splicing, etc. I collaborate with friends in many places: NCBI (USA), Waseda University (Japan), University of Paris VI (France), Leiden University (Netherlands), etc. The lab participates in the FANTOM project, which is a large international consortium . Students joining the lab are welcome to take part in these collaborations, and especially to interact with other labs in Kashiwa and Odaiba. Lab members are encouraged to pursue their own original ideas. We learn from discussions and journal reading together with other labs. Students are welcome from all over the world, and will have a chance to learn Japanese or English, and experience a rich culture. Split-alignment of genomes finds orthologies more accurately. MC Frith & R Kawaguchi, Genome Biol. 2015. A new repeat-masking method enables specific detection of homologous sequences. MC Frith, Nucleic Acids Res. 2011. Explaining the correlations among properties of mammalian promoters. MC Frith, Nucleic Acids Res. 2014. 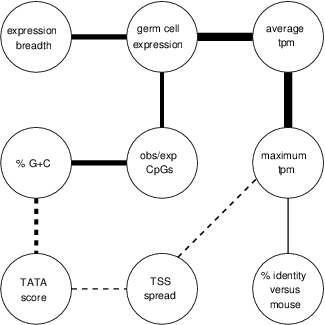 A promoter-level mammalian expression atlas. FANTOM Consortium, Nature 2014. Copyright c Department of Computational Biology and Medical Sciences, Graduate School of Frontier Sciences, The University of Tokyo. All Rights Reserved.